An AC (Air Conditioner) which was once considered to be a luxury item and was only to be found in big hotels, movie halls, restaurants etc... But, now almost everyone has a AC in our home to beat out the summer/winter and those who have it, worry about one common thing. That is their high electricity consumption and chargers due to it. In this project we are going to make a small Automatic Temperature Control Circuit that could minimize the electricity chargers by varying the AC temperature automatically based on the Rooms temperature. By varying the set temperature periodically we can avoid making the AC to work for lower temperature values for a long time and thus making it consume less power. Most of us would have experienced a situation where we have to change the Air Conditioner’s set temperature to different values during different times of the day, so as to keep us comfy throughout. To automate this process this project uses a Temperature sensor (DHT11) which reads the present temperature of the room and based on that value it will send commands to the AC through an IR blaster similar to the AC’s Remote. The AC will react to these commands as if it is reacting to its Remote and thus adjust the temperature. 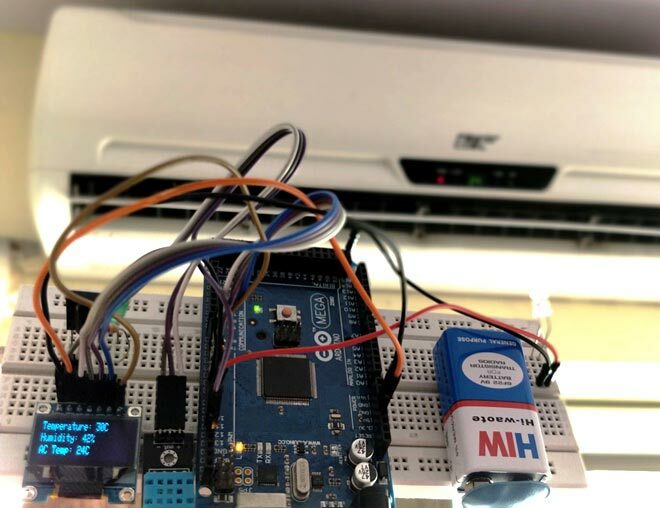 As your room’s temperature changes, the Arduino will also adjust your AC’s set temperature to maintain your temperature in just the way you want it to be. Sounds cool right?... Let’s see how to build one. All the Remote Controls in our home that we use to control TV, Home Theatre, AC etc work with the help of IR Blasters. An IR blaster is nothing but an IR LED which could blaster a signal by repetitive pulsing; this signal will be read by the receiver in the electronics appliance. For each different button on the remote a unique signal will be blasted which after read by the receiver is used to perform a particular pre-defined task. If we are able to read this signal coming out from the Remote, we can then mimic the same signal using an IR LED when ever required to perform that particular task. We have previously made a IR Blaster circuit for Universal IR Remote. A TSOP is an IR Receiver that could be used to decode the signal coming from the Remotes. This Receiver will be interfaced with Arduino to signal for each button and then an IR Led will be used with Arduino to mimic the signal when ever required. This way we can gain control over our AC using Arduino. Now, all that is left is to read the Temperature value using DHT11 and instruct the AC accordingly using the IR signals. To make the project look more attractive and user friendly I have also added an OLED display that display the current Temperature, Humidity and AC set temperature. Learn more about using OLED with Arduino. This Automatic AC Temperature Controller project is slightly advanced for beginner’s level, however with help of few other tutorials anyone can build this with matter of time. So if you are a absolute newbie to OLED, DHT11 or TSOP then kindly fall back to these tutorials below where you can learn the basics and how to get started with these. The list might seem to be bit long, but trust me it’s easy and worth learning, also it will open doors to many new projects. Before we proceed into the project take some time and notice how your AC remote works. AC remotes work in a bit different way compared to TV, DVD IR remotes. There might be only 10-12 buttons on your Remote, but they will be able to send a lot of different types of signals. Meaning the Remote does not send the same code every time for the same button. For example, when you decrease the temperature using the down button to make it 24°C (degree Celsius) you will get a signal with a set of data, but when you press it again to set 25°C you will not get the same data since the temperature is now 25 and not 24. Similarly the code for 25 will also vary for different fan speed, sleep settings etc. So let’s not fiddle around with all options and just concentrate only the temperature values with a constant value for other settings. Another problem is the amount of data that is being sent for each button press, normal remotes with send either 24 bits or 48 bits but an AC remote might sends up to 228 bits since each signal contains a lot of information like Temp, Fan Speed, Sleep timing, Swing style etc. This is the reason why we need an Arduino Mega for better storage options. Luckily the hardware setup of this Automatic AC Temperature Control Project is very easy. You can simply use a breadboard and make the connections as shown below. The following table can also be used to verify your connections. The first step to control your AC is to use TSOP1738 to decode AC Remote Control IR Codes. Make all the connections as shown in the circuit diagram and make sure you have installed all the mentioned libraries. Now open the example program “IRrecvDumpV2” which can be found at File -> Examples -> IRremote -> IRrecvDumpV2. Upload the program to your Arduino Mega and open the Serial Monitor. Point your Remote towards TSOP and press any button, for each button you press its respective Signal will be read by the TSOP1738, decoded by Arduino and displayed in the Serial Monitor. For every change in temperature on your Remote you will get a different Data. Save this Data for we will be using it in our main program. Your serial monitor will look something like this, I have also shown the Word file on which I have saved the copied data. The Screenshot shows the code for setting the temperature at 26°C for my AC remote. Based on your Remote you will get a different set of codes. Similarly copy the codes for all different level of temperature. You can check all the Air Conditioner Remote control IR codes in the Arduino Code given at the end of this tutorial. The complete main Arduino program can be found at the bottom of this page, but you cannot use the same program. You have to change the Signal code values that we just obtained from the Example sketch above. Open the main program on you Arduino IDE and scroll down to this area shown below where you have to replace the array values with the values that you obtained for your Remote. Note that I have used 10 Arrays out of which two used to Turn ON and turn OFF the AC while the rest 8 is used to set different temperature. For example Temp23 is used to set 23°C on your AC, so use the respective code in that Array. Once that is done, you just have to upload the code to your Arduino and Place it opposite of you AC and enjoy the Cool Breeze. The Explanation of the code goes as follows, first we have to use the DHT1 temperature sensor to read the Temperature and Humidity and display it on the OLED. This is done by the following code. Here the AC will be set to 24°C when the Measured temperature is 30°C (since desired temp is 27). Similarly we can create many If loops to set different level of temperatures based on the measured temperature as shown below. When your Code and hardware is ready, Upload the Code to your Board and you should notice the OLED displaying something similar to this. Now place the circuitry opposite to your Air Conditioner and you notice the AC’s temperature getting controlled based on the rooms temperature. You can try increasing the temperature near the DHT11 sensor to check if the AC’s temperature is controlled as shown in the Video below. You can tweak the program to perform any desired action; all you need is the code that you obtained from the example sketch. Hope you understood this Automatic Temperature Controller project and enjoyed building something very similar. I know there are lot of places here to get stuck, but don’t worry then. Just use the forum or comment section to explain your problem and people here will surely help you to get it solved. As far as i know irsend does not work with arduino mega due .How did you make that happen ?? Why does IR not work with Mega? me too. have you known why? Arduino:1.8.5 (Windows 10), 开发板："Arduino/Genuino Uno"